Strangler fig tree in Costa Rica. Locally known as Guanacaste. 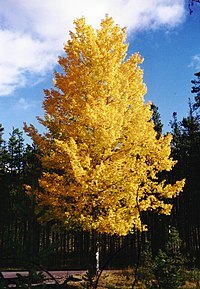 A tree is a tall plant with a trunk and branches made of wood. It can live for many years. The four main parts of a tree are the roots, the trunk, the branches, and the leaves. The roots of a tree are usually under the ground. One case for which this is not true are the roots of the mangrove tree. A single tree has many roots. The roots carry food and water from the ground through the trunk and branches to the leaves of the tree. They can also breathe in air. Sometimes, roots are specialized into aerial roots, which can also provide support, as is the case with the Banyan tree. The leaves of a tree are green most of the time, but they can come in many colours, shapes and sizes. The leaves take in sunlight and use water and food from the roots to make the tree grow, and to reproduce. The dark lines between the centre and the bark are medullary rays, which allow nutrients to flow across the tree trunk. As a tree grows, it may produce growth rings as new wood is laid down around the old wood.It may live to be a thousand years old. In areas with seasonal climate, wood produced at different times of the year may alternate light and dark rings. In temperate climates, and tropical climates with a single wet-dry season alternation, the growth rings are annual, each pair of light and dark rings being one year of growth. In areas with two wet and dry seasons each year, there may be two pairs of light and dark rings each year; and in some (mainly semi-desert regions with irregular rainfall), there may be a new growth ring with each rainfall. The roots of a tree are generally down in earth, providing anchorage for the parts above ground, and taking in water and nutrients from the soil. Most trees need help from a fungus for better uptake of nutriens: this is mycorrhiza. Most of a tree's biomass comes from carbon dioxide absorbed from the atmosphere (see photosynthesis). Above ground, the trunk gives height to the leaf-bearing branches, competing with other plant species for sunlight. In many trees, the order of the branches makes exposure of the leaves to sunlight better. Not all trees have all the organs or parts as mentioned above. For example, most palm trees are not branched, the saguaro cactus of North America has no functional leaves, tree ferns do not produce bark, etc. Based on their general shape and size, all of these are nonetheless generally regarded as trees. Trees can vary very much. A plant form that is similar to a tree, but generally having smaller, multiple trunks and/or branches that arise near the ground, is called a shrub (or a bush). Even though that is true, no precise differentiation between shrubs and trees is possible. Given their small size, bonsai plants would not technically be 'trees', but one should not confuse reference to the form of a species with the size or shape of individual specimens. A spruce seedling does not fit the definition of a tree, but all spruces are trees. The earliest trees were tree ferns, horsetails and lycophytes, which grew in forests in the Carboniferous period; tree ferns still survive, but the only surviving horsetails and lycophytes are not of tree form. The Coast Redwood: 115.56 m (379.1 ft), in Redwood National Park, California is believed to be the world's tallest tree. The life-span of trees is determined by growth rings. These can be seen if the tree is cut down or in cores taken from the edge to the center of the tree. Correct determination is only possible for trees which make growth rings, generally those which occur in seasonal climates. Trees in uniform non-seasonal tropical climates are always growing and do not have distinct growth rings. It is also only possible for trees which are solid to the center of the tree; many very old trees become hollow as the dead heartwood decays away. For some of these species, age estimates have been made on the basis of extrapolating current growth rates, but the results are usually little better than guesses or speculation. The three major (big) sources of tree damage are biotic (from living sources) , abiotic (from non-living sources)and Deforestation (cutting trees down). Biotic sources would include insects which might bore into the tree, deer which might rub bark off the trunk, or fungi, which might attach themselves to the tree. International standards are uniform in analyzing damage potential and sizing TPZs (tree protection zones) to minimize damage. For mature to fully mature trees, the accepted TPZ comprises a 1.5-foot clearance for every 1 inch diameter of trunk. That means for a 10 inch tree, the TPZ would extend 15 feet in all directions from the base of the trunk at ground level. For young or small trees with minimal crowns (and trunks less than 4 inches in diameter) a TPZ equal to 1 foot for every inch of trunk diameter may be good enough. That means for a 3 inch tree, the TPZ would extend 3 feet in all directions from the base of the trunk at ground level. Detailed information on TPZs and related topics is available at minimal cost from organizations like the International Society for Arboriculture. ↑ "Gymno Database: Sequoia sempervirens". http://www.conifers.org/cu/se/index.htm. Retrieved 2007-06-10. "Hyperion, Redwood National Park, CA, 115.55 m"
↑ White J. 1990. Forestry Commission Edinburgh. ↑ 8.0 8.1 8.2 8.3 Gymno Database: How old is that tree?. Retrieved on 2008-04-17. ↑ "Benefits of Tree Climbing". http://www.treeclimbing.com/index.php?option=com_content&view=category&layout=blog&id=17&Itemid=140. ↑ Wiseman, P. Eric 2008. Integrated pest management tactics. Continuing Education Unit, International Arboricultural Society Vol 17. ↑ 19.0 19.1 Mountfort, Paul Rhys (2003). Nordic runes: understanding, casting, and interpreting the ancient Viking oracle. Inner Traditions / Bear & Company. p. 41. ISBN 9780892810932 . http://books.google.co.in/books?id=_3B7EmvAqngC. This page was last changed on 30 November 2014, at 16:36.